Have we got a treat for you! Our cvc words clip cards! We have lots of clip card sets providing hours of learning fun. There are 8 sets of cards and three sets of letters for each cvc word family. The cards include the following sets: a picture for the words with the word spelled out (as in all the images you see below); a picture without any letters (kids fill in the letters); the words without a picture (kids match the pictures to the words); pictures and words with the vowel in red; 3 sets – pictures and words with either the first, middle or last letter missing (kids fill them in); and lastly the words with three pictures (kids clip the matching picture). They’re better felt than telt…go ahead and take a look at all of these cvc word families! 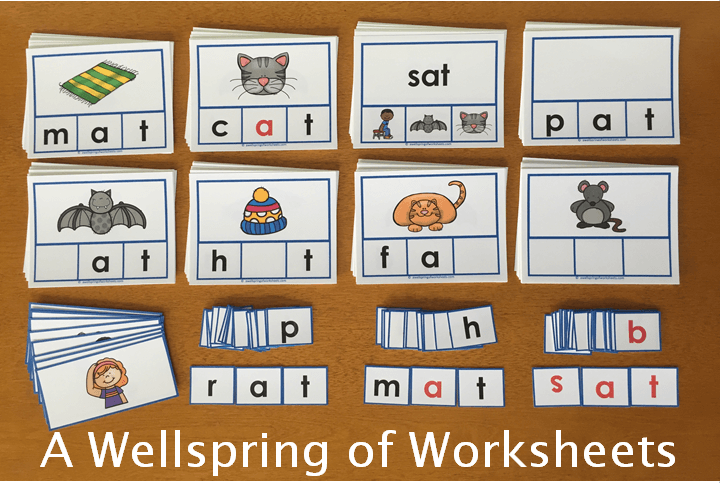 Go to this page to see even more kindergarten phonics resources. 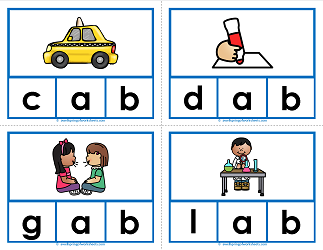 Here are some new cvc words kids can learn: cab, dab, gab, lab, and tab. This 20 page set of clip cards for the -ab words includes 8 sets of cards with three sets of letters in black and red. 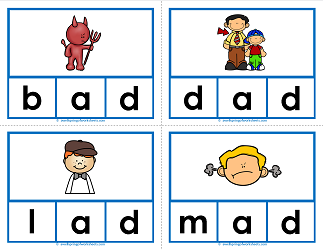 With cute and engaging graphics, the words bad, dad, lad, mad, pad, and sad can be found in this -ad word family set. Eight different activities and three sets of letters in black & red are included. 20 page set. 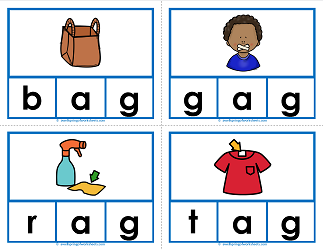 This set of -ag words clip cards uses the words bag, gag, rag, tag & wag in 8 sets of cards; 3 sets of letters in black & red are included in this 20 page set. So you want your kids to learn the -an family of words? Why not try these clip cards? The words ban, can, fan, man, pan, ran, and van are used in 8 sets of cards and include 3 sets of letters in black & red. Here’s a very nice set of -ap family clip cards. 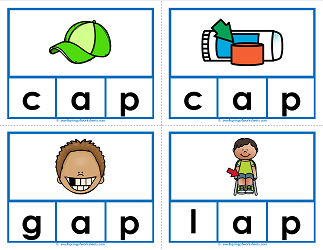 Using the words cap (the hat), cap (a lid), gap, lap, map, nap, tap (as in touching something) & tap (as in faucet water) kids build cvc words while learning new vocabulary! 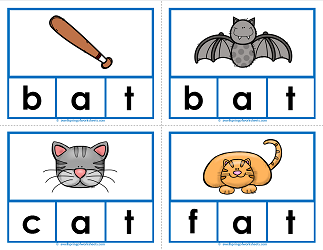 Our largest set of clip cards, -at word cards, includes the following nine words: bat (as in baseball), bat (as in the animal), cat, fat, hat, mat, pat, rat, and sat. 32 pages of all kinds of clip cards. 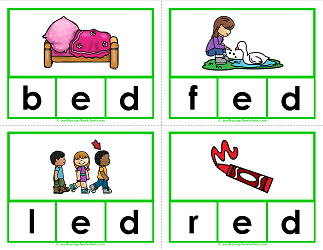 Use the 20 pages of provided letters and cards to build and take apart the -ed words bed, fed, led, red and wed. Clip the letters and pictures on, or clip the picture that represents the word. The words beg, leg and peg are used in this set of -en word cards. Clip the letters in place or clip the object to identify the word, and more! Have tons of fun while learning. The five words in this set of -en clip cards are den, hen, pen, men and ten. 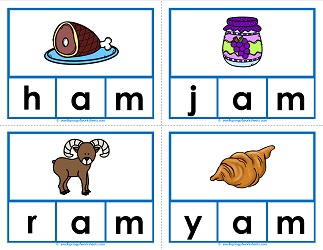 Have kids clip the missing letters in the correct places, sound out the letters and the words. 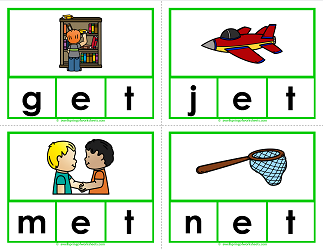 With this set of -et word clip cards you’ll be ready to teach your kids all about the words get, jet, met, net, pet, set, vet and wet. The job is easy with these 8 sets of cards and 3 sets of letters. 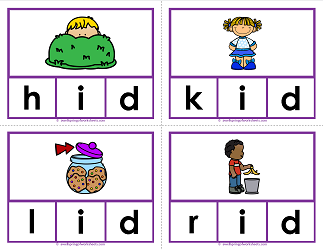 Hope you enjoy this set of -id words clip cards using the words hid, kid, lid & rid. They come in 8 different sets of cards for the optimal number of ways to build and identify cvc words. 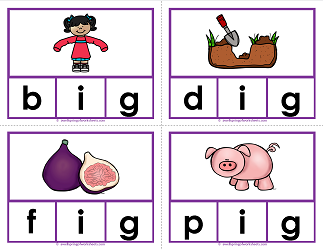 In this 20 page set of -ig word clip cards your kids will build and dissect the words big, dig, fig, pig, rig, & wig in 8 different ways. Three sets of letters are included, too. 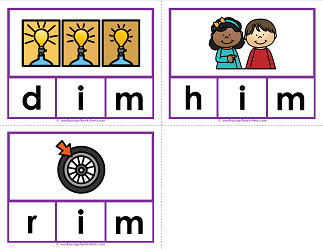 With three -im words in this clip cards set – dim, him, and rim – you’ll get to add to the fun of using the cards by teaching your kids about dim lights and the rim of a tire. All in a days work! Welcome to the world of -in words! 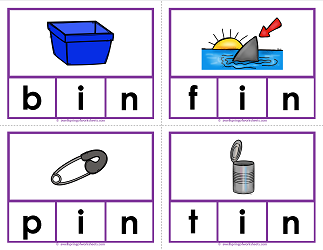 These clip cards use the words bin, fin, pin, tin & win to help kids get familiar with the concept of cvc words. Twenty pages of fun activities. 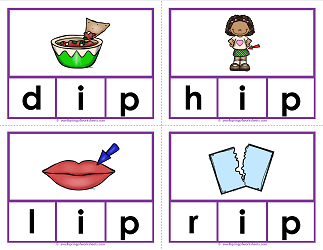 Using the words dip, hip, lip, rip, sip, tip, and zip, this set of -ip word family clip cards should provide hours of learning fun for your youngsters. Check out the variety of cards and the sets of letters, too.